Most budget travelers to Singapore gravitate towards the tiny nation's Chinese ethnic enclave for accommodations. Singapore's Chinatown offers an embarrassment of riches where budget hotels are concerned: the relatively low cost and central location of the enclave's hotels and hostels put guests in the middle of the action, in more ways than one. Easy access to temples, hawker centers and a wealth of Chinatown shopping make these hotels prime picks for guests who want to see the real Singapore up close, for the duration of their stay. The Inn at Temple Street was created out of five refurbished shophouses in the middle of Singapore's historic Chinatown district. Nevertheless, guests enjoy modern facilities commensurate to the cost of their stay - air-conditioning, bathroom, personal electronic safe, and satellite TV come standard with each room. The location is ideal for tourists who want to see Singapore on foot. Travelers who enjoy local color will best enjoy their stay at the Inn during Chinese New Year, when all of Chinatown is alive with food stalls and parades. The Park 22 is a 55-room boutique hotel set in a pre-war heritage shophouse; from selected rooms, guests can look out from private balconies with full-length shuttered windows on the upper floors. Most of the rooms, though, have no windows, so specify beforehand. The rooms are clean and hygienic, although there is little space to go around. The hotel is close to Outram Park MRT Station and Pearl Centre; you can get plenty of cheap eats at the latter. 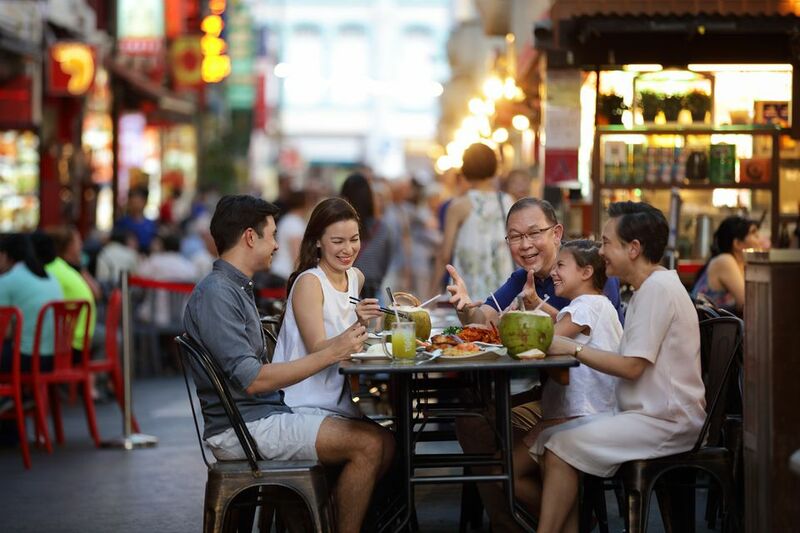 Image courtesy of the Singapore Tourism Board. Thanks to the Backpacker's Inn's central location, its guests get walking-distance access to Chinatown's best shopping, dining, and drinking scene, mostly conducted in the area's famous well-preserved shophouses. The guestrooms are air-conditioned, and guests enjoy 24-hour security, access to WiFi, washing machine and dryer, and kitchenette. Hot showers and toilets are shared by guests. Choice of dorm accommodations or private rooms available. Guests can toss one back at the ground-floor Cow and Coolies Karaoke Bar. The small rooms might be a disadvantage, but the Hotel 81 in Chinatown has one thing going for it: location. The Hotel 81 Chinatown is directly across the street from a Chinatown MRT Station exit (read about Singapore's transportation system), and guests seeking to explore the rest of the district by foot can't go wrong by making this hotel a starting point, given its location at the corner of New Bridge Road and Upper Cross Street. Guests seeking great eats cannot go wrong by trying the nearby Maxwell Food Court. The 25-room Yes Chinatown Point Hotel gives you exactly what you pay for: small air-conditioned rooms and not much more (some of the rooms barely have enough space for the bed, much less the luggage). Some rooms have showers, but use communal toilets; specify a deluxe room to get a bathroom en suite.